U.S. marks 150th anniversary of Homestead Act offering free landThe United States on Sunday marks the 150th anniversary of President Abraham Lincoln signing the Homestead Act, the law that gave away 270 million acres of land and transformed the vast American interior. Representatives from 30 states will take part in a ceremony at the National Monument of America in the Nebraska town of Beatrice, representing the states where nearly 2 million people each received 160 acres of free land under the program.And:Not everyone benefited from the Homestead Act. 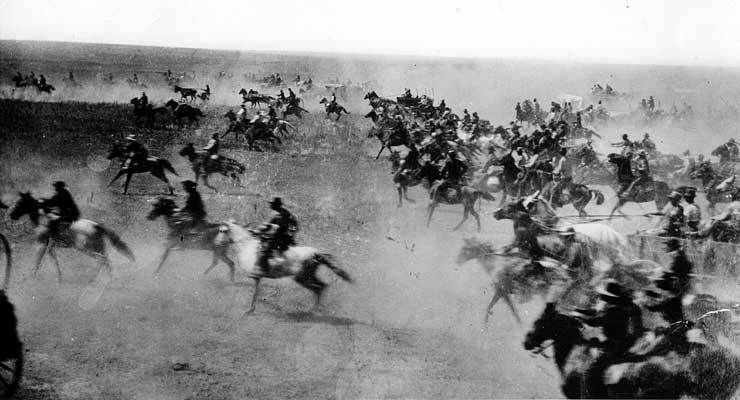 Engler said the law accelerated the removal of Native Americans from some states, especially across the Plains. With few exceptions, they were not allowed to homestead until 1924, when Native Americans were able to become U.S. citizens. The act was in effect for 123 years. Homesteading ended in the continental United States in 1976. It ended in Alaska in 1986. In addition to the American West, homesteading took place in the South because land confiscated from plantation owners after the Civil War was deemed public land. Texas had no homesteading because it did not have federal public land. History can't be done a priori.A considerable number of libertarian commentators have remarked on the sheer scale of subsidies and protections to big business, on their structural importance to the existing form of corporate capitalism, and on the close intermeshing of corporate and state interests in the present state capitalist economy. We pay less attention, however, to the role of past state coercion, in previous centuries, in laying the structural foundations of the present system. The extent to which present-day concentrations of wealth and corporate power are the legacy of past injustice, I call the subsidy of history. As Ludwig von Mises pointed out in Socialism, the normal functioning of the market never results in a state of affairs in which most of the land of a country is “owned” by a tiny class of absentee landlords and the peasant majority pay rent for the land they work. Wherever it is found, it is the result of past coercion and robbery.In particular:The Homestead Act of 1862, an apparent exception to this general trend, was really just another illustration of it. The majority of land, rather than being claimed under the terms of the Homestead Act, was auctioned to the highest bidder. Even for land covered by the Act, according to Howard Zinn, the $200 fee was beyond the reach of many. As a result, much of the land was not homesteaded on Lockean principles at all, but initially went to speculators before being partitioned and resold to homesteaders. And compared to the 50 million acres covered by homestead legislation, 100 million acres were given away as railroad land grants during the Civil War—free of charge! In other words, the privileged classes got the gravy, and ordinary homesteaders got the bone.Comment: In this case, of course, the "peasant majorities" were Indians. Much of today's concentrated wealth began with government subsidies to railroads, ranchers, miners, and drillers. So our "free market" economy has always been a crock. The country was "built" by elitists using government power to enrich themselves at the expense of Indians and other Americans. "Past" theft doesn't even describe it. Look at things happening today. Bernie Madoff with a bunch of people's money, the banks can say "We need $1 trillion. Can we borrow it? Oh, we lost it lol can we have another trillion? ", and we have conservatives who don't even want transparency on if a CEO is robbing his shareholders blind. In terms of Indians, we still have reservation lands being partitioned off for resources to some extent. A few Eskimo villages are on oil fields. The only debate is whether they'll be evacuated elsewhere due to global warming, or just forced off. Expect uranium as an issue. Reagan may have said some Indians are rich from oil. Maybe, maybe not. But I distinctly remember reading about Pine Ridge being infested with corruption reminiscent of a Third World country that just discovered oil in the 70s.